In 2010 he officiated the penalty shoot out win over Leicester City. In 2011 the debacle against Reading. Both play off semi finals. In 2012 he's back. This time it's a Carling Cup semi final. He will be assisted by Jake Collin and John Flynn. The 4th official will be Jon Moss. It's not Webb's first City match this season. He was in charge at Upton Park when Cardiff bloodied West Ham's nose on the opening day. Webb will be fresh from Sunday's thrilling 3 - 2 home win for Man City over Spurs. He allowed a Mario Ballotelli kick to Scott Parker's head before awarding Man City a penalty for a foul on Ballotelli which the Italian converted. 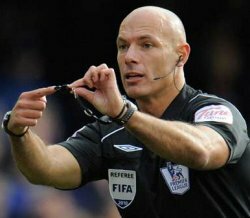 Webb is a top top official who has taken chage of Champions League and World Cup finals. If he would award City a few penalties and send off three Palace players I'd appreciate it.